Since its creation, Flower Campsites has been for and about people. None of our member site has more than 250 pitches, so they’re neither too big, nor too small. Keen to put people first, they set the highest standards in terms of friendliness, personal service, quality, cleanliness and facilities. Highly individual, they all have a flavour of their particular area and a desire to share it with their visitors, but each in their own personal manner. We like this Flower spirit an we hope to share a very good moment with you. 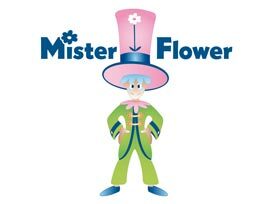 Mister Flower has landed at our kids' campsites! Mister Flower is an explorer from a world unknown to man. Reaching the Blue Planet, he discovers its seas and oceans, mountains and valleys, fields and forests – not to mention the humans who live on it! Fascinated by what he sees, Mister Flower decides to stay and to continue his exploration of the mysteries of Earth in the company of its children. A holiday with Mister Flower is all about having fun and making new friends. The club offers a varied programme of fun and games, parties and shows, workshops, craft activities and trips organised by our trained, multi-lingual activity leaders in a safe and stimulating environment. All your children need for a truly unforgettable holiday and certainly no time to get bored! • Living together: A range of entertaining group activities designed to help children mix and make friends, including board games, treasure hunts, sports, plays and shows. • The great outdoors: Mister Flower is a great explorer and loves sharing his discoveries and the beautiful French countryside with children. Typical activities might include a storytelling coastal path walk, how to build a cabin in the woods, a hike and picnic on the shores of a lake or a nature trek to seek out nature’s “hidden” animals (bees, birds and insects). • Local customs and culture: Culture with a difference. Mister Flower just loves telling fascinating stories, stories – and holidays – that your children will never forget. Activities might include a visit to a local lighthouse, for example, and jam or pancake making workshops. And if it all sounds a bit too much like lessons, if you think your kids might bored, don’t worry! Flower campsites aren’t summer schools. Your holidays will still be as fun and as relaxing as ever. The Mister Flower Club just adds the Flower touch to your children’s holiday experience, helping them to discover and explore the world around them in a traditional, healthy camping environment.